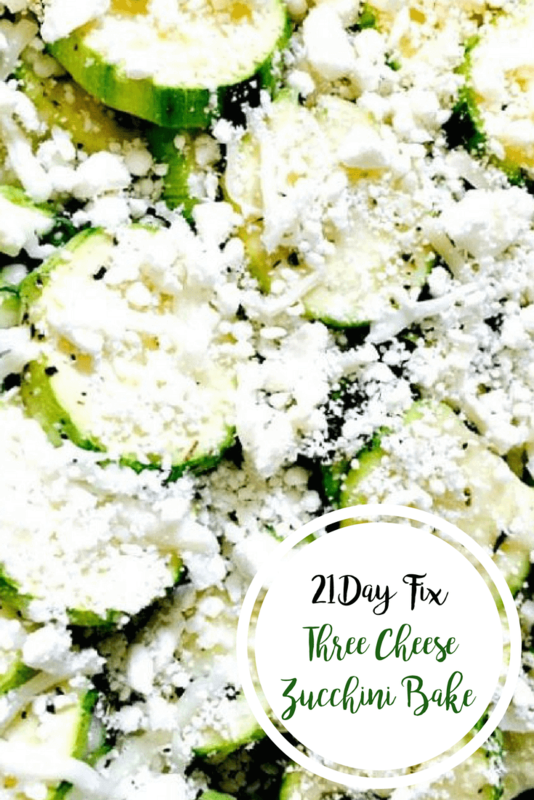 This 21 Day Fix Three Cheese Zucchini Bake is a delicious side dish for a brunch, lunch, or dinner! 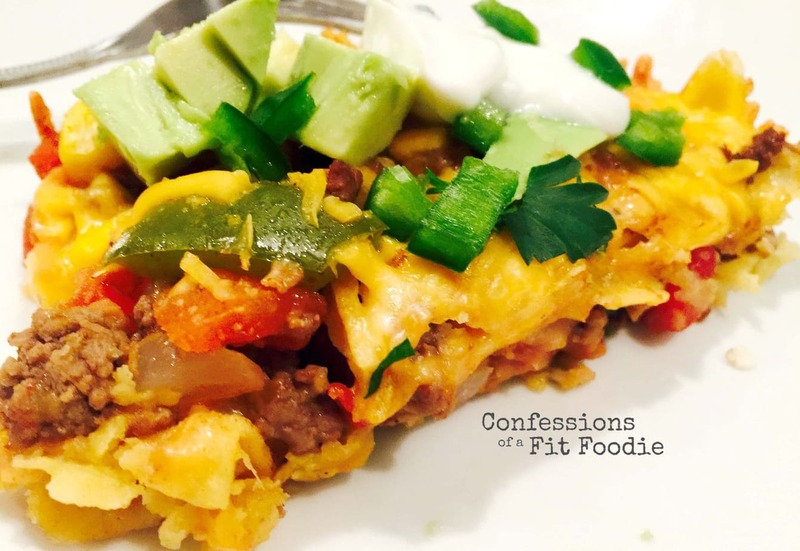 It’s so quick to come together and reheats perfectly – I often have leftovers for breakfast. I’ve been making this zucchini dish for the past four years…almost to the day. I found it on Kalyn’s Kitchen while planning the menu for my daughter’s second birthday. She just turned six and I am struggling majorly with how quickly time is passing. Don’t get me wrong, there are definitely days where I think about how life will get easier as my kids get older. Especially my little one. But most days I remember the words of my grandmother, who always told me that her 30s, when her kids were little, were the best years of her life. Despite how hard it was – and she had 4 kids and a husband who worked the night shift – they were her favorite. So anyway, back to this dish (and sorry for those of you who are just here for the recipes! I do get sidetracked!) Oh – and Kalyn. Keep her blog in mind this summer, especially if you grow zucchini. This is your woman. 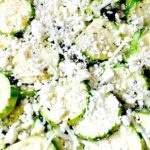 I love this recipe as it is super easy to prep and always a crowd pleaser, even when people don’t claim to like zucchini. And over the years I have tweaked this recipe to make it my own (umm… who doesn’t love a little feta? ), and to also make it FIX approved, but it remains a favorite for sure. Double it and serve it for a holiday brunch – and eat the leftovers as a yummy breakfast or side dish. 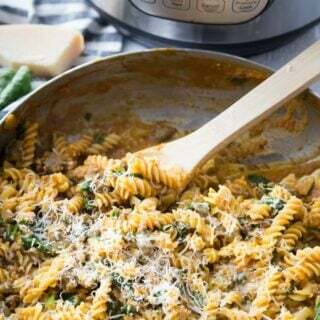 It tastes great reheated or just cold from the fridge, if you are impatient like me! Looking for more zucchini recipes? 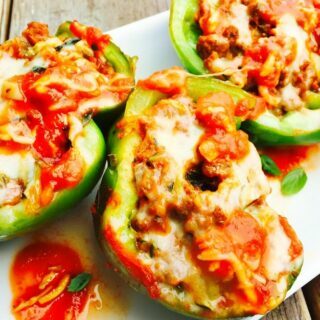 Check out this post of 30+ Zucchini Recipes for the 21 Day Fix for tons of my favorites! Preheat oven to 350F. Spray an 8″ x 8″ baking dish with olive oil or non-stick spray. 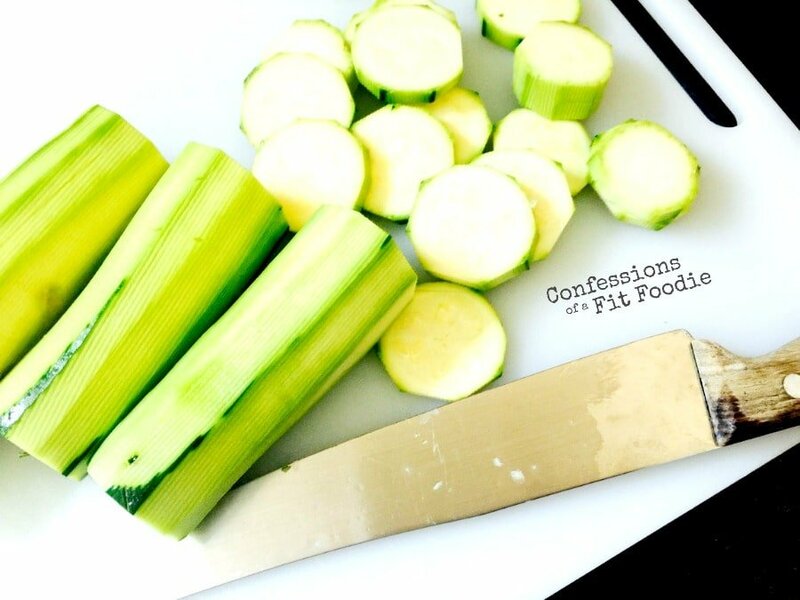 Wash the zucchini and cut in slices or half-moon slices. Wash basil, spin dry or dry with paper towels and finely chop. 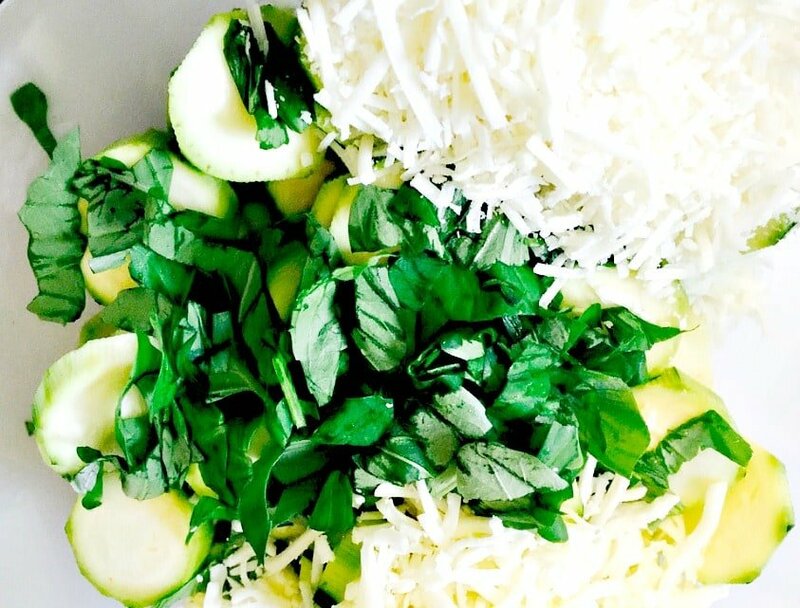 Combine the sliced zucchini, chopped basil, dried spices, 1/3 cup of mozzarella cheese, 1/3 cup of Parmesan and stir together until the veggies are coated with cheese and the herbs are well-distributed. Season with salt and fresh ground black pepper. Put the mixture in the baking dish and bake uncovered for about 25-30 minutes. 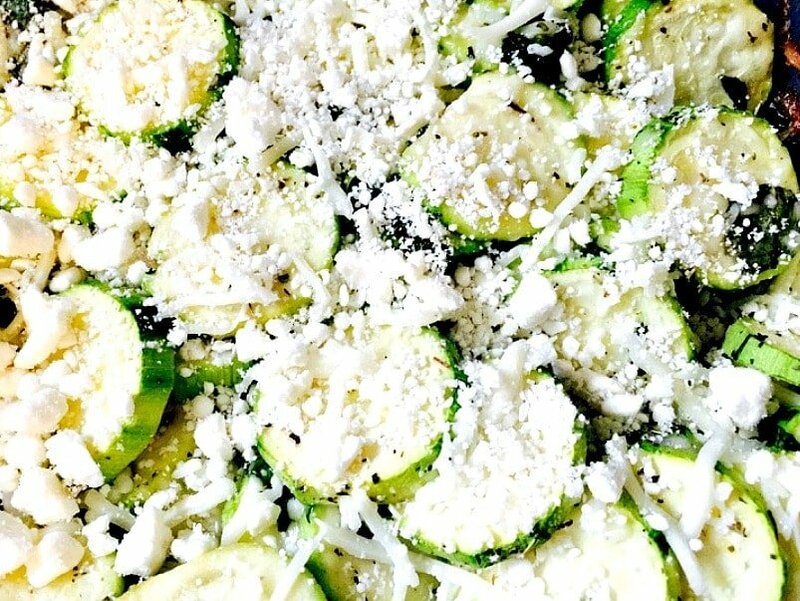 When the zucchini is nearly cooked through, take the casserole dish out of the oven and sprinkle over the remaining mozzarella and feta cheese. Put the dish back in the oven and bake 10-15 minutes longer, or until the cheese is melted and nicely browned and zucchini is fully cooked. Broil for the last 2 minutes if desired. 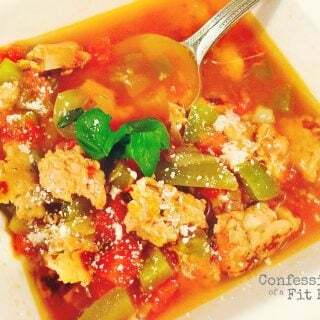 Oh my, I love the idea of adding Feta to this! Glad you have enjoyed it so much! And thanks for the nice comments! You just made my day!!! I’m a HUGE fan – thanks for being a blogger role model for me :).